A Pound of Prevention for a Healthier Life shows the connection between oxidative stress and the onset of virtually all disease and discusses the causes of oxidative stress induced disease and ways to prevent it. The book includes a unique questionnaire for predicting disease onset in seemingly healthy people, and shows how steps taken to prevent any one disease may prevent many other unrelated diseases. Dr. Harold I. Zeliger, a chemical toxicologist who has been researching the causes of non-communicable diseases for more than 40 years, demonstrates how elevated oxidative stress is responsible for attacks on virtually all body organs and systems and how it triggers the onset of numerous diseases, including ADHD, autism, heart disease, respiratory disease, diabetes, obesity, Alzheimer's disease, Parkinson's disease, cancer and numerous others. The many sources of oxidative stress include not only exposures to toxic chemicals such as pesticides, air pollutants, PCBs and organic solvents, but also to radiation, tobacco smoke, eating some foods, pharmaceutical drug use, illnesses a person already has, emotional stress and others. Zeliger's research shows how elevated oxidative stress need not come from a single source, but can come from multiple sources, and that it is total oxidative stress, no matter what the source or sources, that causes disease. The Oxidative Stress Index, which can be individually arrived at from the questionnaire in the book, allows the reader to determine his or her oxidative stress level, which sources are responsible for it, and what actions can be taken to reduce it and lower the likelihood of disease onset. Dr. Zeliger has personally investigated hundreds of instances of diseases and injuries caused by chemical and environmental exposures and has published numerous medical and scientific journal articles on the subject. Dr. Zeliger's research on the effects of exposures to chemical mixtures has led to whole new areas of inquiry regarding disease causation and to the publication of his book, Human Toxicology of Chemical Mixtures, a reference work used worldwide, now in its second edition. 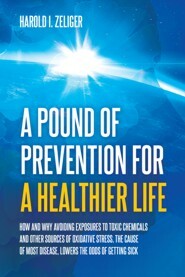 His discoveries include showing that exposures to mixtures of chemicals can lead to many diseases, including cancers, that are not known to be caused by the individual components of such mixtures as well as to the subject of this book, the role of oxidative stress in disease causation. This book shows how elevated oxidative stress increases the likelihood of disease onset in healthy people, why lowering oxidative stress can reduce the odds of getting sick, steps that can be taken to reduce oxidative stress and how a questionnaire can be used to predict oxidative stress levels,. All the information contained in this book is based upon Dr. Zeliger's research and that of others which has been published in medical and scientific journals and books. He has written this book to share that information with lay people in a clear, concise and readily understood way.